It's hard to imagine any kitchen without appliances that is designed for cooking. It can be a gas or electric stove. Progress in this technique began with the appearance of induction plates at the end of the twentieth century. Induction plates differ from electric ones in that they do not use energy for direct heating of the spiral: it is aimed at creating electromagnetic induction in a closed circuit. Such a device works on the principle of a transformer. An inductance coil is located at the bottom of the working surface, an electric current passes through the coil. This coil is the primary winding, and the dishes that are placed on the stove constitute the secondary winding. In dishes, as in the secondary winding, induction currents are formed, ensuring its heating. Products that are prepared in it, basking from this dish. At the same time the glass-ceramic surface remains cold. These heaters have their own positive and negative qualities. It is useful to know them in order to understand what can be expected by acquiring such a technique. Security. The glass ceramic surface does not heat up and is not dangerous for children and adults. It is completely fireproof. The generated magnetic field in 22 μT is safe for humans. This danger is less than from using a mobile phone. Easy to clean. Considering that the surface always remains cold during work, food does not dry out, does not form difficult to clean. Cleaning is easily done with a damp cloth without the use of abrasive-containing products and metal wool. The food prepared on it never burns, the dishes are always clean and do not deteriorate. Efficiency. Plates have different modes of operation, some up to seventeen positions. When the set temperature is reached, the stove turns off and then quickly goes to the desired mode, which provides significant energy savings. When induction heating to a minimum, heat losses are reduced, since heat is released directly in the pot, which also contributes to an increase in the rate of its heating. A significant reduction in electricity is ensured by the high efficiency of induction stoves - 90% (for comparison, the gas stove has 60-65%). With such indicators, food is cooked much faster than on an electric stove. Booster (English booster, from boost - raise, strengthen). Performs an additional function, increasing the initial energy, which leads to an increase in the intensity of heating by 50%, provides protection against overheating and, if necessary, provides an automatic shutdown of the stove. Performing the function of an amplifier, booster helps to reduce the cooking time. The main disadvantage - of course, is the relatively high cost. The possible need for the cost of acquiring new utensils made of magnetic materials. Utensils made of aluminum alloys, copper alloys, as well as ceramic and glass are not used. If the developers have not provided for an insulating magnetic “heat sink” in the design, such an oven is not installed above household appliances that have a metal body (refrigerator, oven, dishwasher). Having got an induction cooking surface, they do not hasten to get rid of the dishes that have served for many years. Among it are dishes with ferromagnetic properties, which can be successfully used for cooking. Begin with an inventory of the dishes in the house. Determine its ferromagnetic properties of the magnet. Magnet "sticks" - dishes suitable for further use. If some dishes are not enough, there is no problem to buy it in the store. They buy utensils made of cast iron, enameled, made of magnetic stainless steel. When preparing dishes, it is taken into account that its diameter should not be less than 12 cm, and the thickness of the bottom - 2-6 mm. Cast iron cookware is more expensive than stainless steel, however, it is preferred because stainless steel cookers emit nickel when heated, which is harmful to health. Also, it is not non-stick. 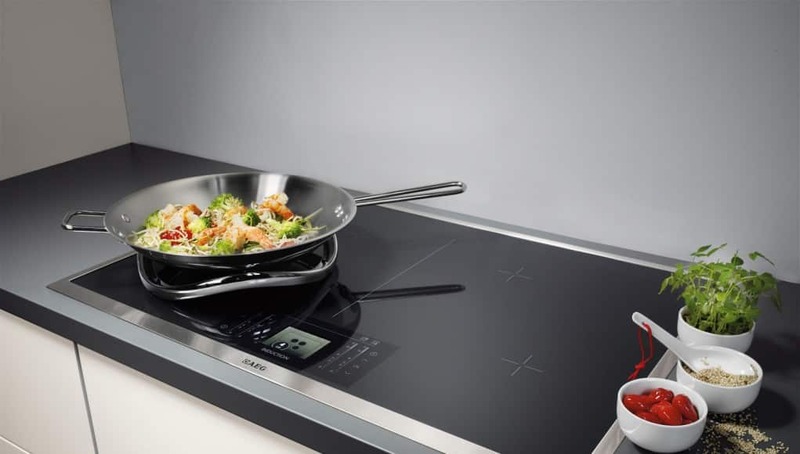 Today, many housewives who have the opportunity to cook on an induction hob, respond positively to her. Given the positive recommendations and good performance, they have the right to use, despite their cost, as the economic effect that the owner receives allows you to recoup the costs as soon as possible. I recently had an induction cooker. And the acquisition makes me very happy. The only thing I had to get used to was a slight noise when the surface was running at maximum power. I really like that after you remove the pan from the hob, the surface cools down very quickly, and the part that goes beyond the hob generally remains cold. She cooks quickly, so I think she will soon replace conventional electrical surfaces. Generally, if you choose a well-known manufacturer, then there will be no problems with the absence of an insulating magnetic “heat sink”. I have an induction hob, and right there in the instructions indicated the required distance from other metal wind instruments. If before you had a usual cooking surface, then you will certainly see the difference, and in a positive way. Fast cooking, no scorching. I would not like to change my surface for anything else, the usual one does not suit me now. I have an induction stove in my kitchen, and I just don’t like it, the food is cooked even faster than on the gas stove. From the extra dishes, I bought only a cast-iron pan, so all my enameled pans approached my induction cooker. So it does not always have to spend money, but the price of such surfaces is high, but then, you will not burn yourself on its surface, and no scrapers are needed. I have never regretted that I purchased an induction cooker.